In many ways this book does exactly what it says on the label. If you want to know anything about Baphomet, then this is your book, as it covers the historical origins of the name, cowled and candled in ceremonial magic, from the persecution of the Templars, through Eliphas Levi, Aleister Crowley and Death Metal to current-day Chaos Magic. The book begins with a chemical creation myth that places the human in sobering perspective within the web of the scientifically perceived natural world, in this way, the book firmly establishes Baphomet’s environmental credentials and role as nature-spirit of life. 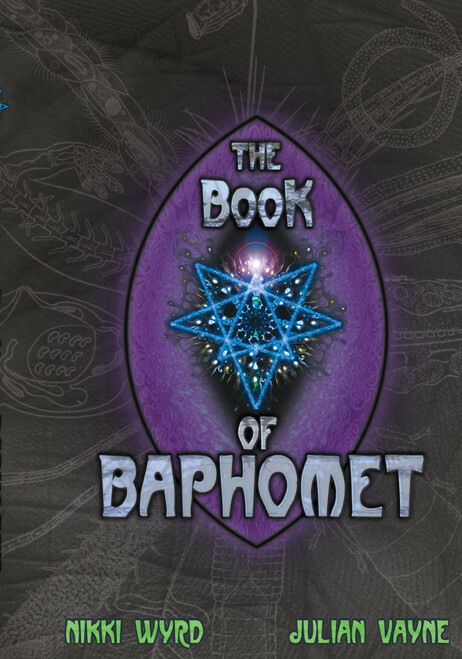 The Book of Baphomet is co-written by Nikki Wyrd and Julian Vayne, two authors with proven track records in the IOT – the Illuminati of Thanateros – the seminal Chaos Magic group, so the book specifically explores the significance of and contact with Baphomet within that particular magical paradigm. Weaving visionary tracts, personal anecdote and transcribed ritual with common neo-pagan memes – Margaret Murray, the horned god, Bran, Wicca, Druidry and Pan, throwing the net wide and inclusive in true Chaos fashion, a grand thumping monograph of Baphomet is created. As you may have guessed by now, The Book of Baphomet is no beginners guide, moreover, it is a serious, complicated and thought-provoking read. I found it necessary to keep pen and notepad to hand while reading, because this is a text that asks to be studied, with note-taking, re-reading, re-checking and follow-up research of references, and to aid this there is an impressive bibliography. Such an in-depth book is a rare and satisfying find. Nikki Wyrd is the Head of the IOT in Britain, while Julian Vayne has published a number of books on Chaos Magic, most recently a collection of articles – Magic Works – concerning Vayne’s experiential work, it includes “Magic With a K” which I think is the first written account of the ritual use of Ketamine.